Zambia Revenue Authority (ZRA) has collected over K27.7 billion in gross taxes, with refunds amounting to K4.5 billion. ZRA Commissioner General, Kingsley Chanda, disclosed this when he officiated at a ZRA Media Breakfast briefing in Lusaka today. ZANIS reports that Mr. Chanda stated that the authority has a net collection of K23.2 billion which is 6.4 percent above their target of K21.8 billion. Mr. Chanda said the authority paid out K 4.2 billion in VAT refunds. He said that out of this amount, 60 percent was paid to the mining sector while 40 percent was paid to other sectors of the economy. The Commissioner General revealed that during the same period, K193.21 million was offset against approved and established refund liabilities. He attributed the performance to the strong outturn of domestic and import VAT during the period under review owing to the successful implementation of key administrative and policy measures. Mr. Chanda disclosed that government has foregone the total K2.4 billion on account of various trade concessions. 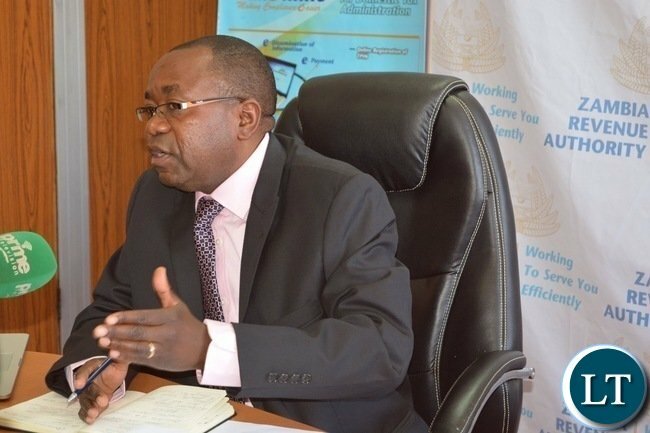 Meanwhile, the Commissioner General revealed that the authority has extended the deadline for Tax Payer Identification Number (TPIN) registration for existing bank account holders from June 30th 2018 to December 31st 2018. Mr. Chanda said the deadline only applies to persons who already had bank accounts at the time the law was amended. And ZRA Mr. Chanda said government has restricted timber exports to finished and processed products. He announced that only the Zambia Forestry and Forest Industries Cooperation (ZAFFICO) is allowed to export Mukula. Mr. Chanda explained that other entities wishing to export Mukula may do so through ZAFFICO by obtaining requisite legal documentation. Let’s do it! He will NEVER be president! Let him Hallucinate all day long and all month long with his believers. “Zambia Revenue Authority (ZRA) has collected over K27.7 billion in gross taxes, with refunds amounting to K4.5 billion….but yet again, all this money will go straight to Lungu and his cronies to do as they please with it”. That’s gross taxes, subtract the misused money. what is the net taxes so PF can complete Mushindo University? ZRA is doing a really good job. Let us congratulate them, on behalf of Zambia and not politicize this. Good work Mr. kingsley Chanda. @Nzelu Are you looking for a job in ZRA? If Kinsley is doing well, why they failed to paint that brown building, where witches land on roof at night to pee? Iwe Chi Nostradamus kikikikiki ” If Kinsley is doing well, why they failed to paint that brown building, where witches land on roof at night to pee? ” You made me laugh. Some one else within the ZRA is in charge of upkeep. Job discription my friend kikikikiki. Why are some Zambians so bitter and negative like 1 and 2. Where was I bitter? I am really happy for this. The ZRA is doing a good job. I see you mean Nostradamus 2.1, NiMizimu zinaba kola kikikikiki. We’ve been independent since 1964 and that’s all we can collect? No wonder out budget is so low compared to Kenya’s $30bn and Angola’s $45bn budgets. Y borrowing if they’re collecting above target?